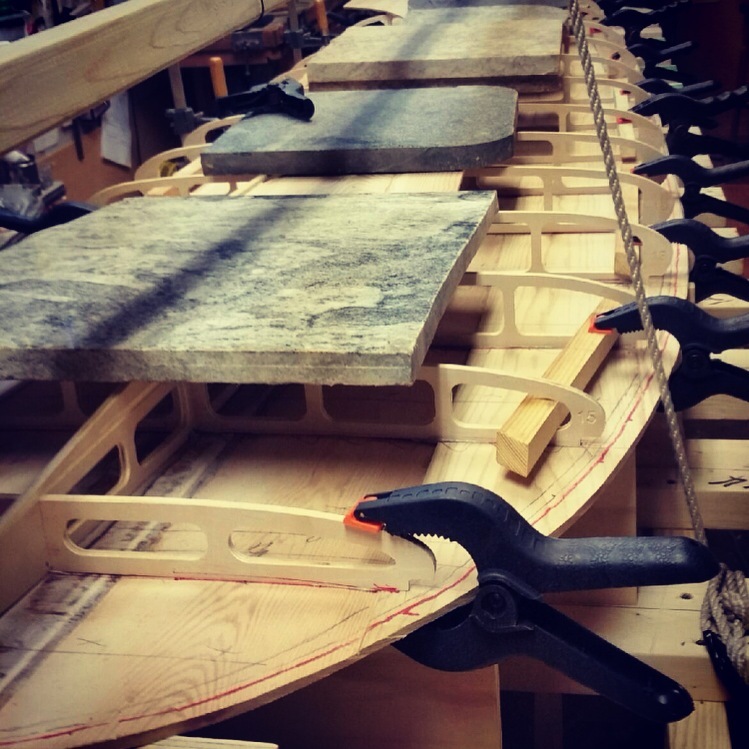 Attaching the Fishbone to the bottom skin is a very rewarding step in building your hollow wood board. Once complete your project really looks like the board it is going to be. This is one step that is very helpful to have a helper. It is possible to do a great job of this step without help but you have to be organized. If this is your first time doing this you might want to do a dry run without adhesive. It is better to know ahead of time if your chosen method of securing the strong back is quick and easy. Lay down a small bead of Pl-Premium or 3m 5200 Fast Cure on the marks you made during the layout step. 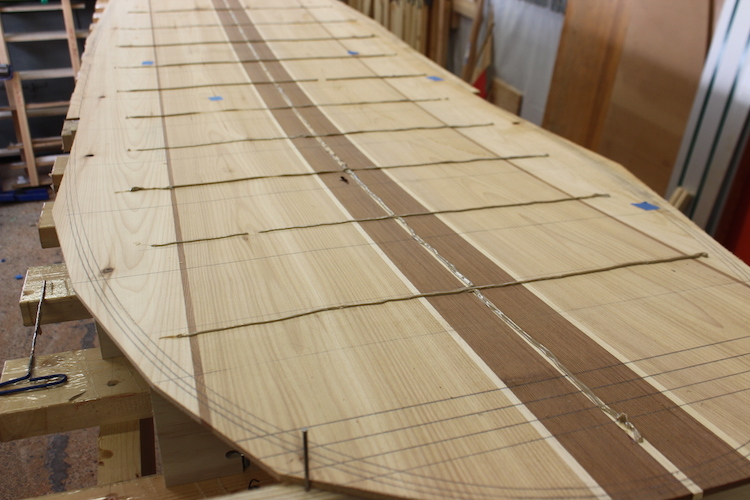 If you don’t have a contrasting stringer like this Yellow Cedar stripe just mark the centre with a pencil before applying the adhesive. Note: I changed my mind on where I would place this board on the panel so there is a second set of marks not being used. Carefully place the fishbone frame in the fresh adhesive. 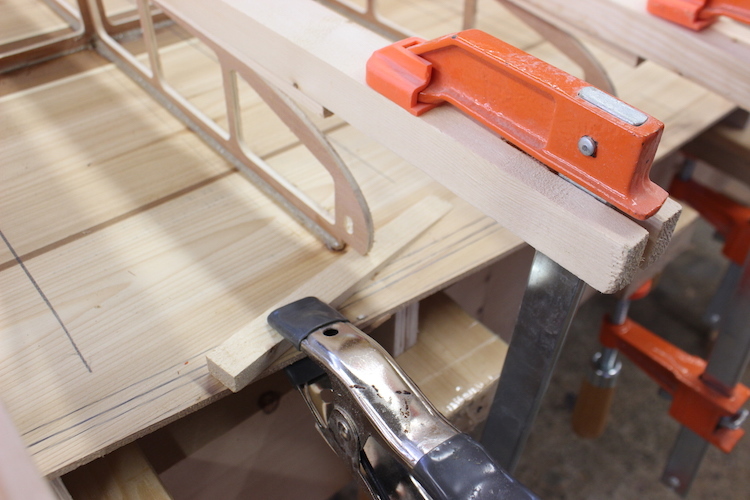 Place some weight on the fishbone to temporarily hold it in place while you attach the clamps or straps. Start by aligning the centre spar then then set the ribs square. 3. Start adding strong back from the centre toward the nose and tail. Do every second rib to start and then complete the ones you skipped. 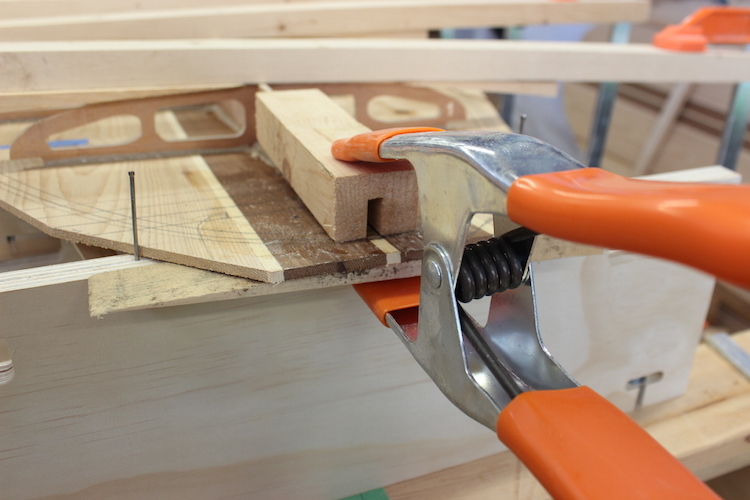 Wedges and spring clamps come in handy to keep everything aligned perfectly. This wedge is shown holding a rib square to the frame. Not that the adhesive stops before the notch at the bottom of the rib. 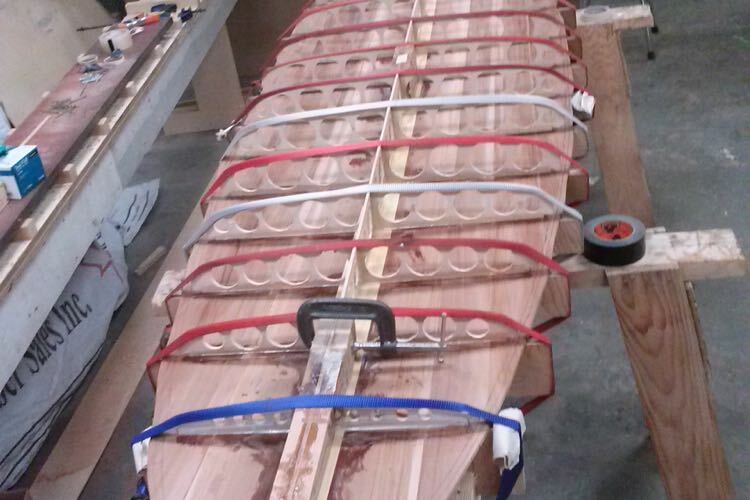 The back of a wedge is being used to hold the rib from drifting sideways. You can tell how much pressure by just looking at under board where it meets the rocker table. You only require enough pressure to make sure you can’t see daylight between the rocker table and the skin. Note: the rocker table only touches on the low side. 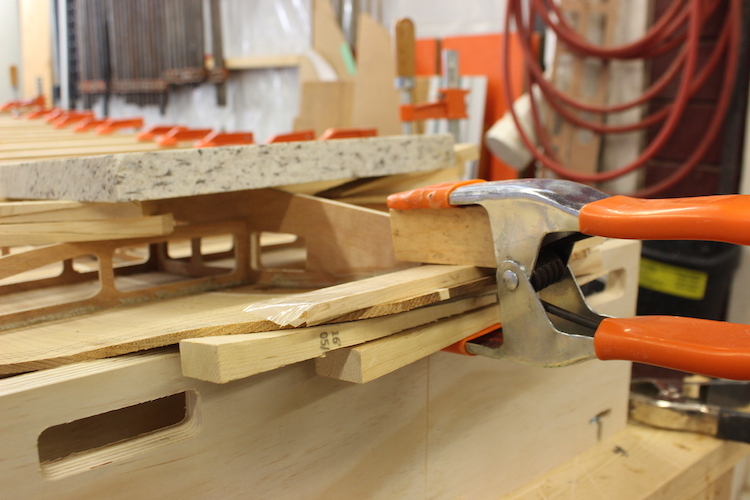 The weight of my heavy-duty bar clamps is really all that is required. 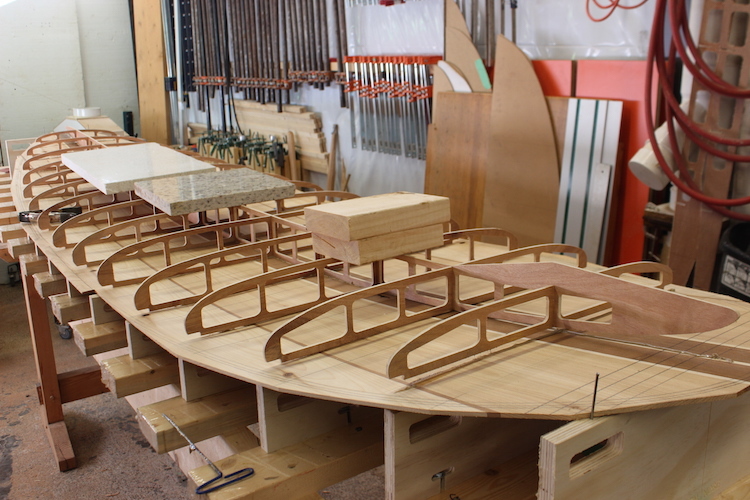 I barely tension them (maybe a 1/4-1/2 turn) once they are slid into position. Check your centre spar constantly as you are working. You do not want to have everything secured and then find out the spar is wavy. A friend is really helpful for this. If the spar is out a little you can usually just slide it on the wet adhesive to where you want it and lock it into position with a wedge. 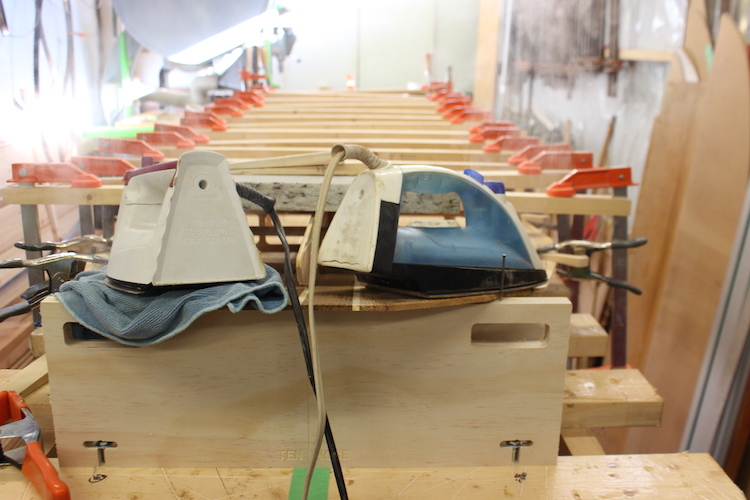 It is best to align the centre and then press wedges in by hand to press the ribs firmly onto the rocker table. The nose and tail might require some steam. It is best to stop your adhesive a few inches from the ends and then come back to them after everything else is secured. The bottom skin needs to be flexed into position so it is no problem to add the adhesive after steaming. The iron on the right is sitting on a damp rag. The iron on the right is just steaming where the damp rag just was. It doesn’t take very long (1-2 minutes) with a thin skin. 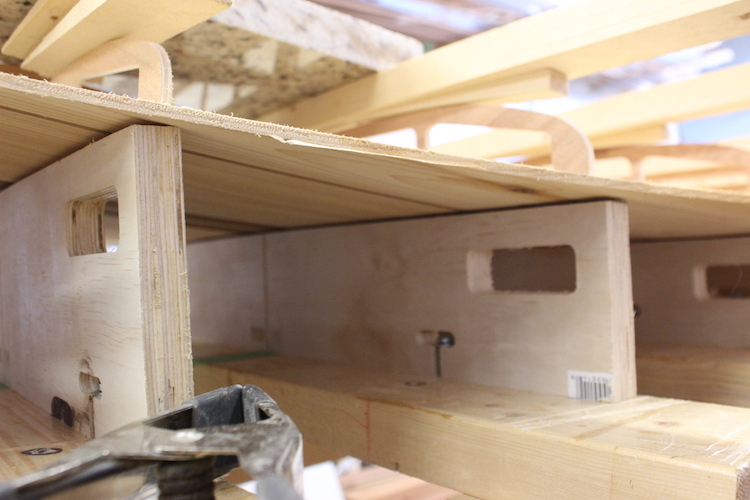 Carefully flex the skin into position with support across the grain. If you just pinch the steamed wood with no blocking you run the risk of getting splits on either side of the clamp. The nose here has support on the top and bottom of the skin and a block transferring pressure to the nose of the fishbone’s gusset. The tail doesn’t usually require a lot of flexing into position. 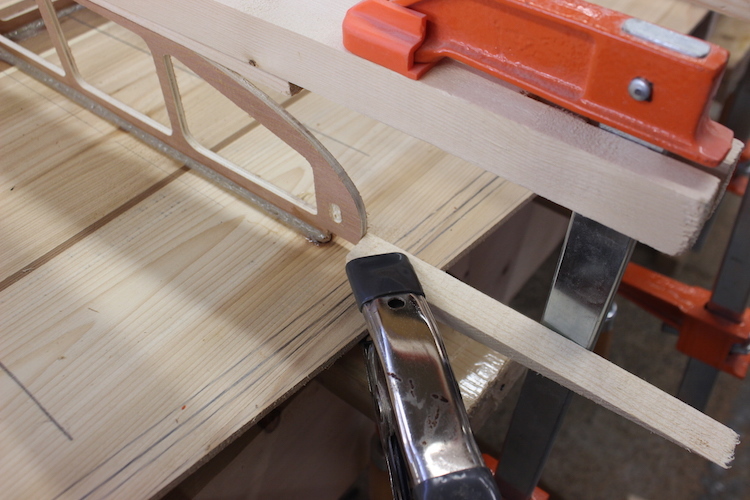 The little block with the saw kerf transfers the clamping pressure further inward than the clamp can reach. 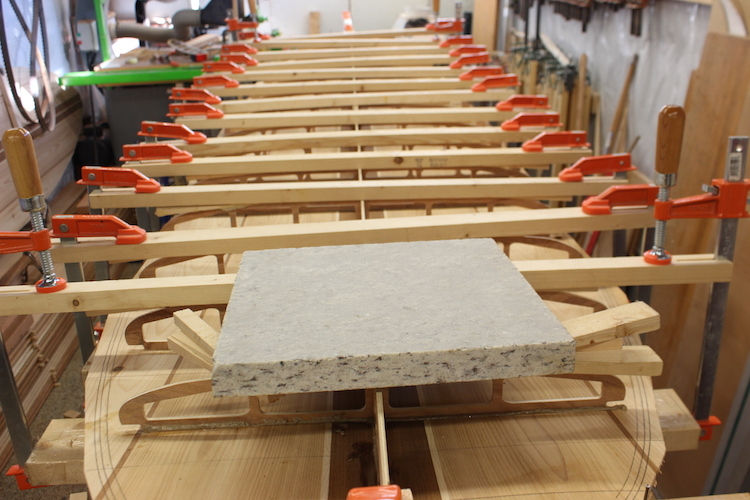 It is also used to reduce the clamping pressure depending how much of the block is projected inward. Run a small bead of adhesive against the fishbone and the bottom skin. Use your finger to create a gusset to strengthen the joint. Clean up any stray adhesive and leave for 24 hrs. Now go clean your finger or you’ll have to wait till the adhesive wears off! Note: The weights that I use are sink cutouts from a granite counter shop. The tiles are flat, smooth and FREE. Even better you can sharpen tools on them with the scary sharp method! A customer sent me this picture showing how he attached his fishbone with just webbing straps! Another customer using gravity along with some inexspensive spring clamps.